A Bible-based Ministry dedicated since 1986 to the preaching of the WHOLE gospel message of present truth centered in Jesus Christ. Our church sermon for Sabbath, April 20, 2019 is: "The Divine Law"
“Let There Be Light” Ministries is concerned with the spreading of God’s Biblical message of salvation in its fullest sense. We are a Ministry of faith, dependent upon God and are not part of any denominational church. 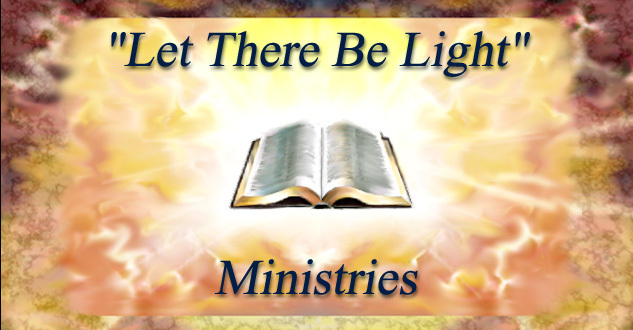 This Ministry has provided many of its Present Truth publications for your reading enjoyment, with the privilege of freely downloading any information which you find spiritually enlightening. Also, many of our publications, especially in the area of “Booklets” and "Tracts", have been translated into several languages, and these are also provided for your reading and downloading pleasure. To order any of these publications, please click here. Thank you for visiting our site, and may God richly bless you with His wisdom and truth (James 1:5; John 14:26, 16:13) as you “study to show thyself approved unto God” in the short amount of time left us to “prepare to meet thy God” when He comes again (2 Timothy 2:15; Amos 4:12). Rogue River, Oregon 97537-0328 U.S.A.